When reading biographies, I’m always disappointed when letters are quoted in part and not printed in full, because I’m interested in even the mundane details of a life. 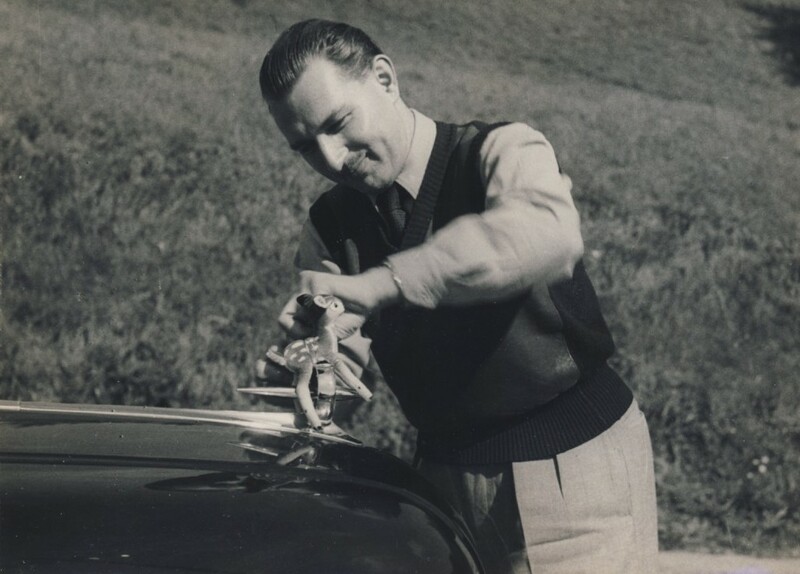 Vlado’s life was anything but mundane in 1957, and his letters tell a great story – Mary Liz was just one part of it. 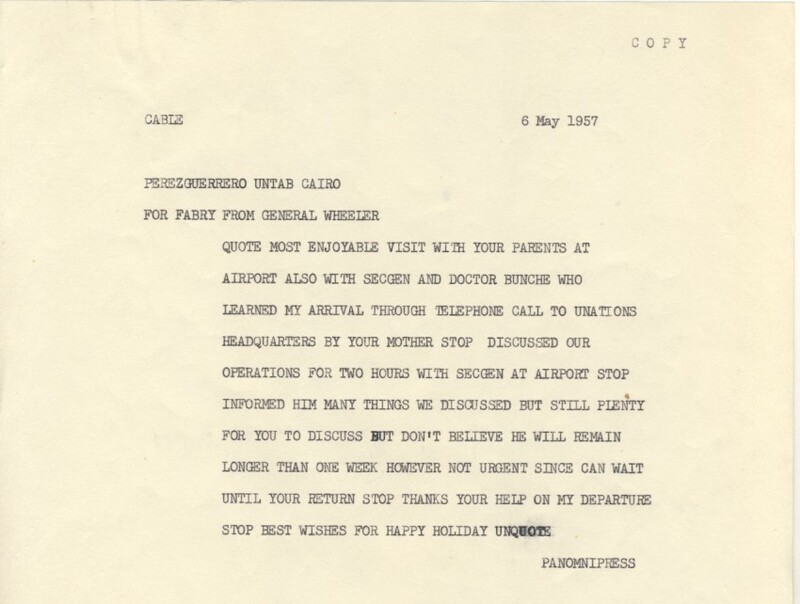 I’ve also included here correspondence from General R. A. Wheeler (a.k.a. “Speck”), Oscar Schachter, Vlado’s sister Olga (Olinka – who we learn has had a head injury that postpones a wedding to man she later decides not to marry); and Don Sullivan, who sent a poorly phrased letter that pushed an exhausted Vlado too far, showing that even someone as intelligent and respected as Vlado had his bouts of insecurity. And though I have not included the letters of Vlado’s Maminka and Tatulo, they make an appearance here in their own charming way. Thank you for your letter of 29 April. We had been wondering why we had not heard from you for so long a time, but I am glad to learn at long last that you had a particularly enjoyable assignment and that you found General Wheeler and the rest of the group so congenial. You may recall my discounting the story which you got about possible difficulties in working with the General. I am glad that your relations turned out to be as I anticipated. Stavropoulos told me that you had requested about five weeks’ leave and I am certainly agreeable to your taking it. I am terribly sorry to learn of Olga’s accident but I hope that by this time she has entirely recovered. We had heard somewhat indirectly about the forthcoming wedding but we were not quite sure of the date. I hope you found your parents well and in good spirits. Please give all of the family our warm regards. We look forward to seeing you on June 20th. Mr. and Mrs. Connors and I cordially invite you to buffet supper at our residence at 6:00 p.m. Sunday, 21 April. As we near the end of our Mission here, we wish to express our sincerest appreciation for your loyal and efficient assistance throughout our strenuous task. It will be a great pleasure for us if you are able to come to our farewell party. Will you kindly let Miss Picard know if you can come. Just wanted to wish you a Happy Easter! And tell you that a package is on its way to you. However, I had it planned so that you would get it on the 20th and now I see in your last letter that you’ll be leaving Egypt on just that date. Honestly, I could scream! Aside from that, I think it’s wonderful that you[‘re] leaving – finally. I hope you had a good trip, arrived safely and found everything just as you expected. Your poor little left-over here is quite busy and rather sad; Egypt and life in general without you just isn’t quite the same. Nothing in particular happened since your departure except that two packages arrived with some workshop instruments. Basil just came from Ismaïlia; everybody there remembers you and of course they all miss UNSCO and you in particular. I reviewed and revised the Syllabus and it is being typed now. If we can finish typing it before the pouch closes, you will find it enclosed, if not it will have to wait until the next pouch. Yesterday and today I worked on Chapter XV – Administration and Finance and tonight I plan to tackle the concluding chapter. I will send you a copy of both separately with Friday’s pouch to complete your set of the provisional draft of the report. I am enclosing the clippings of two articles from local papers which I think might be of interest to you. I spoke this morning with Aly Khalil and he will send to you an English summary of any interesting articles that appeared in the Egyptian press at the occasion of your departure. I am also enclosing the apportionment of cost of hire of salvage vessels to the individual wrecks, but unless you cable me and instruct me so, I shall not append this information to the report. Whoever wants to take the trouble can prepare a table for himself from the operational chart of work done on the wrecks. Your two albums received from Col Younes were given to the Information Centre for pouching whenever their weight permits. I think that’s about all, except for my best wishes for a very pleasant vacation. P.S. I sent a little thank you note and a few flowers to Mrs. Idriss also in the name of all the others who were invited on Friday afternoon; I am mentioning this only so that you are not surprised if you hear about it. Please find enclosed two copies of the revised draft of the Syllabus, as well as two copies of the first draft of Chapters XV XVI of the report. The only gap in the report now is the description of the “extraordinary feats” of our salvage crews in Chapter XVI, paragraph 5, which as you may remember, Jack Connors undertook to provide; I might try my hand on it when preparing the final draft. If you have any comments to make on what I said in these two chapters, please cable me. I worked quite hard since you left and spent all my days and evenings in the office. But my work is progressing very slowly and I am still only about halfway through the report. There are so many things that give rise to second thoughts or flash danger signals when re-read, that making a second draft is nearly like writing the report anew. I am also trying to work out the language so that it would require minimum changes when the draft is finalized at Headquarters. I expect and hope to be able to send you the complete revised draft by next Friday’s pouch. As agreed, I will send a copy to you directly to Washington; three copies to you at Headquarters in a sealed envelope to be held until your arrival; and one copy to be held at the UN for Mr. Connors. Thank you for your kind cable from Paris. I also got a letter from my mother who of course is enthusiastic about you but felt very sorry for you that you were deprived of your nap during the Geneva stopover. You have probably read about the Secretary-General’s visit to the Middle East. I have asked Shastri to bring to the Secretary-General’s attention my presence here and my availability to report to him on UNSCO if he so wished, and also obtained the necessary visa so as to be ready to travel to Beirut or Jerusalem at a moment’s notice. But there was no reaction to my message so far and I assume that he has probably too many other things on his mind right now. In any event, by your meeting with him in Geneva the need for an immediate oral report has, I believe, been largely obviated. I hope you don’t mind my bombarding you with papers during your vacation. After all, you don’t have to read them. You’re probably thinking that I’m very silly for bringing this up, but I can’t help thinking it’s important — polio vaccination. Everyone here is getting vaccinated (that is, everyone under 40) so I think if you can, you should. The germs have to go somewhere & they’re going to be a lot more virile too. Of course you’re healthy and never catch anything but since everyone else is doing it…..(that’s what the doctors say). It’s going to be so good to see you again Vlado — I can hardly believe it’s only a few more weeks. We’ve got so much lost time to make up. Wish I had time for more but I’m on my way to work now and have to dash. Take it easy on those Swiss mountains. Since I have returned to New York I have been doing some of the completion work required here in the Suez Canal Office. 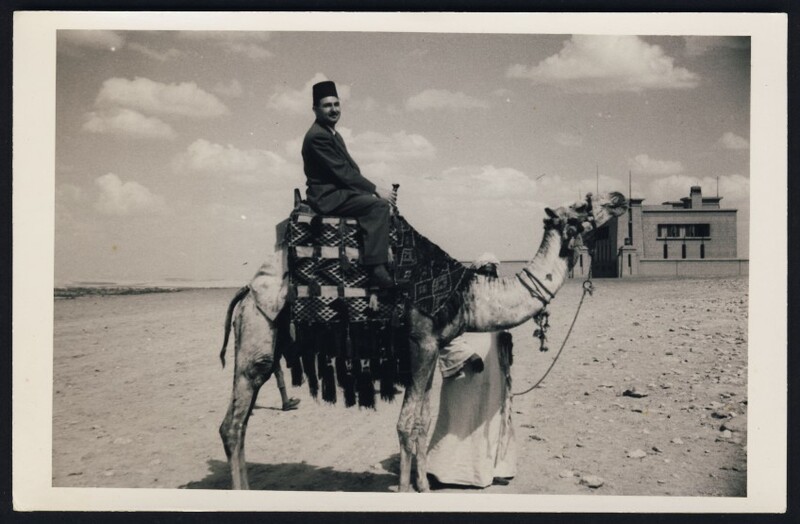 Unfortunately, the question has arisen here by others on the date you were supposed to depart from Cairo. My only reply was that according to the best of my knowledge you were due to depart from Cairo approximately 10 May or the latest 12 May and had planned to spend just a couple of days visiting Luxor. I was advised today that on 20 May you were still in Cairo and were planning to leave there on 22 May. This was quite a surprise to me, but my only reply can be that any arrangements about your delay must be due to a special arrangement with General Wheeler in connection with the report. However, you know that it is rather difficult for us to visualize what type situation developed which required your stay in Cairo as late as 22 May. In a letter received today by Mr. Frerker it was noted that you planned to arrive Monday or Tuesday in Rotterdam. Therefore I am writing this letter to you via the Information Officer in order that it may reach you on Monday. I have been instructed to inform you that you are to finish your work within two days in Rotterdam and mail all papers in your possession to me here at Headquarters. As a result we will assume you are on annual leave beginning Wednesday, 29 May. Furthermore, relative to your extended stay in Cairo from 10 or 12 May to 22 May, I think, for per diem purposes, you should submit a report on your requirements for your continued stay in Cairo. Pending the receipt of this report I have no alternative but to consider your stay in Cairo from 12 May to 22 May as on personal annual leave. I am sorry to have to write you this type of letter, but when we discussed this matter in Cairo I told you at that time that the officials at Headquarters take a rather serious view of mission personnel staying in the area beyond the agreed departure time, unless there is adequate and full justification. You’re post-card arrived on Friday as a big surprise. Here I was thinking you were enjoying yourself in Europe when all the time you were slaving away in Egypt. I would have written if I knew you were still there but I figured that, since you were on vacation and with your family etc., you wouldn’t miss not getting a letter from me. Thank you for that particular card, too. Also I feel that anything I may write seems so trite, especially compared with what you would tell me. I mean, there you are making history and really tidying up this world of ours and here I am telling you about the latest movie I’ve seen. Which reminds me that Karol took me out a while ago and we saw the “Bachelor Party” – very good, people were so real. But before we left each other (to go home) he asked me to try & arrange something with Helse – just the three of us. And I did – about 3 weeks ago we went out & had a very good time. First to the Beekman Towers for a drink, then to Gay Vienna, & we had dessert at the Cafe Geiger. It’s fun playing cupid. Actually, the last movie I saw was “The Mountain” and thought it good from the climbing point of view and the photography but the main character was a little too good to be true. I just couldn’t believe it was Spencer Tracy either. It had a happy ending, which was nice. Some people say he’s pessimistic – I don’t know as all I ever read by him was some short stories and the “End of the Affair.” I must read The Heart of the Matter, tho. Hope you come home early in July since I’ll be going away the 29th to Cape Cod but not with the family (they were so vague about when they would go, I went ahead & made plans with a girlfriend). We’ve got to go hiking together! I’ve been waiting to wear your skirt till you return but I’ve shown it to all my friends & they all agree that it’s just beautiful. I don’t know who actually purchased it and whether you mentioned whom it was for but you may tell the person who bought it that I appreciate and enjoy it so much. Thank you again, you’re a prince. Remember what you said before you left about keeping to myself. You know, I am (in the way I think you meant) but not just because you said so, but because I want to. I trust you have received my letter from Athens and I hope you were able to decipher it. It took me nearly a week to shake off my flu – I would probably not have had the patience to stay in bed that long, but my mother was with me and I had to obey higher authority. She also convinced me that it would not make sense to fly off to Rotterdam on a Friday and we spent three wonderful days in Rhodos, basking in the sun and enjoying the sea and sights. As it turned out, there was no need for me to have a guilty conscience about delaying the Salvor’s operational report: it is still in preparation, and only today was I able to see the draft of its third section. I was pleased to note that our information is more accurate in many respects that that available to Salvors, and the comparison of our draft reports was decidedly not a one-sided affair. I am writing to you under separate cover on the results of my inquiries here. I had a very disagreeable surprise upon my arrival here: a letter from Mr. Sullivan informing me “that it is rather difficult to visualize what type situation developed which required your stay in Cairo as last as 22 May” and that he has no alternative “but to consider your stay in Cairo from 12 to 22 May as on personal annual leave”. 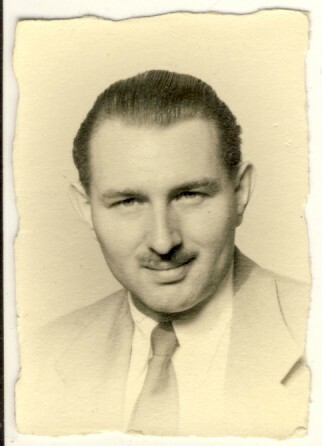 Mr. S. instructed me to finish my work in Rotterdam within two days and to mail all papers in my possession to him. He told me that officials at HQ take “a serious view” of mission personnel extending their stay without adequate justification; the whole tenor of the letter clearly indicates that I am very much in the dog-house. I feel quite certain that Mr. S’s letter was not written on your instructions. In any case, I can’t believe that you would have such a low opinion of my honesty and loyalty to my duties to have authorized a letter questioning my integrity and placing a black mark on my record. I have swallowed quietly and without complaint many an undeserved slight and insult caused to me, and I always tried to assuage the feelings of other mission personnel when they were incensed by Mr. Sullivan’s tactlessness or arbitrary manners. But this time I was too deeply hurt to let things pass without comment. It is not for me to say whether I managed to do an useful job, but I certainly worked hard and long hours up to exhaustion. Since you left Cairo, there was only one evening when I quit my desk before 2 a.m.; I did not even take the time to have a look at the museum or a haircut. I have of course no witness for the solitary evenings spent in the office, but Mr. Perez-Guerrero dropped in occasionally and can testify that I was never idle and quite worn out by the time I left Egypt. Excuse my getting so emotional about it, but I resent very much Mr. S’s implication – and his placing it on the record – that I was goldbricking and trying to swindle the UN out of per-diem or leave. Maybe he cannot visualize how anyone can work hard when his superior’s back is turned, but I happen to be one of those queer characters who take a pride in completing their jobs for the sake [of] achievement and who feel unhappy as long as something is left undone. I still consider myself bound by your instructions to send all my communications concerning the report in a sealed envelope addressed to you, and I am therefore disregarding Mr. Sullivan’s directive to send my papers to him. On the other hand, I cannot but obey his injunction not to spend more than two days in Rotterdam; I am therefore regretfully sending on some of the Appendices in an uncompleted form, not having had the time to prepare a clean copy or (as in the case of Appendix O) to select and annotate the relevant material. I assume it will have to be done in New York. It was a wonderful mission, and having met you and worked for you was one of the nicest things that ever happened to me. I am glad and proud to have been assigned to UNSCO and will always look back with pleasure at the time spent on this assignment (even though my sincere efforts will apparently end up with a blot on my record). I only hope that my work was not quite useless and that you found my services to be of some advantage. I am looking forward to see you and Mr. Connors at Headquarters by the end of this month. Thank you for your letter of 6 May from Cairo, of 27 May from Athens and of 6 June and 7 June from Rotterdam. There is no need for me to tell you again how very much I appreciate the fine work that you have done in completing our report. It is a most excellent job that I am very proud to sign. I am sure that its thoroughness, accuracy and completeness will impress the Secretary-General. “44” obstructions changed to “43”. “five” to a dumping ground changed to “six”. Last sentence changed to read, “Thus, the total number of wrecks which were removed by the United Nations Clearance Operation was 30, although two additional wrecks which had been worked by the Anglo-French salvage fleet were re-worked by the United Nations forces, one of which was re-floated”. 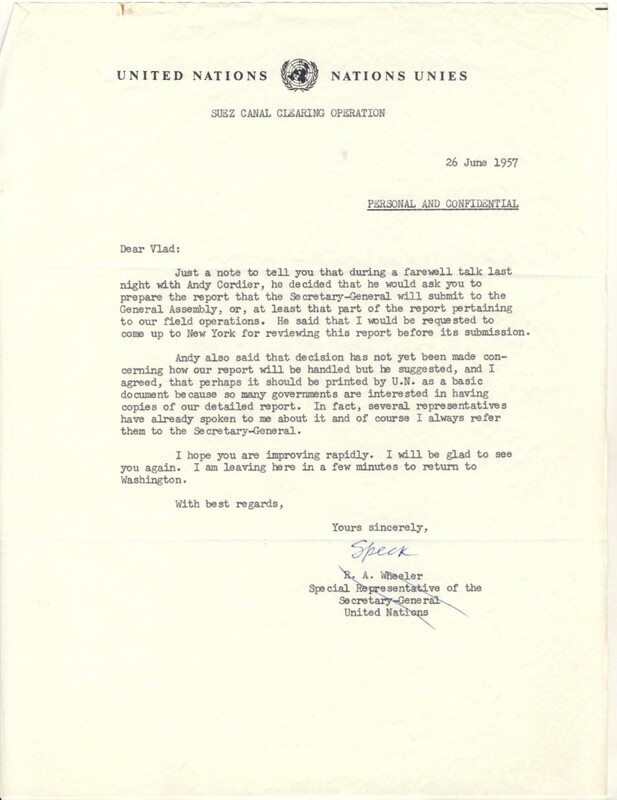 I will, therefore, write a letter to the Secretary-General saying that our report on field operations of UNSCO will be completed and submitted to him before the end of the month; that enclosed is copy of the index of its contents and also copy of the list of appendices; that the report, exclusive of the appendices, will contain about 200 typewritten pages; that there is herewith also submitted a syllabus of our report which, it is suggested, could serve as the desired brief report on our field operations. I don’t know how this letter and our syllabus will be handled by the Secretary-General. Colonel Katzin mentioned that he will be writing a few pages for his report to the S.G., but I don’t know whether it will be a separate one or will become a part of ours. Our complete report will be forwarded to the S.G. about 20 June. We want to submit it as soon as we can complete our careful review and can finish assembling the appendices. Colonel Katzin is going to Rotterdam late in June and, of course, would like to have our report before he departs. Regarding your letter of 6 June in which you referred to a letter from Sullivan, I knew nothing about it until I received your letter. Needless to say, I am very unhappy about any possibility of your receiving any black mark against your record by having done your duty in accordance with my instructions, and I assure you that I have taken the precaution of informing all those involved that you were working under my orders. I had a talk with Oscar Schachter, and I am sure he understands the situation. He asked me my views about extension of your leave until 5 July, and I replied that it had my full approval as you have completed the report most satisfactorily in every respect. I suggest that, if there are any administrative problems in your case, they can await your return for discussion. Naturally, I would be available for any reference that is needed, but I am sure that there is nothing serious for you to worry about. I propose to return to Washington and my old job at the World Bank at the end of June. If necessary for me to return to New York thereafter, I will look forward with great pleasure to reunion with you. Now that Mr. V. Fabry has completed his assignment with the Suez Canal Clearance Operation, I wish to thank you most sincerely for making his services available to us. In writing the report of our field operations, he has performed a valuable and important service to our Mission, for which I shall always feel grateful to him. I wish to commend him highly for his intense application to our work and for his quick grasp of the technical side. He showed unusual ability in clearly and accurately preparing reports of complicated technical operations. I admire Mr. Fabry not only for his high intelligence and professional competence but also for his fine personal character, honesty and integrity. This is just a note. Because I think you might misinterpret a silence. But all I want to do now is wait until I see you. You do understand. P.S. Your package did not arrive yet. But thank you anyway for remembering. As it will take some time before Vladimir can write himself, I thought I better give you the bad news: Vlado came from Holland all drawn out and only a shade of himself, complaining of indigestion. He thought that perhaps the intestinal ‘flu which he caught upon leaving Egypt was coming back. But his fever was getting worse and worse, hovering around 104, with peaks up to 105, and finally last Saturday his doctor conceded that it looks like an infectious hepatitis. You just cannot imagine in what state the rest of the family was…We were all very worried about Vladko, especially the high fever, and until the diagnosis could be stated, we were all in a panic. The doctor said that his body fought the outbreak of the disease very strongly, and it was not until yesterday that it could be proved that Vladko has in fact jaundice of the tough virus type, contracted sometimes between 6-12 weeks ago. It is too early to say yet how long it would take to cure him, but it is usually the matter of 2-3 months. The doctor also said that the ‘flu he had when leaving Cairo was apparently part of it. I am very sorry for Vladko, he was so much looking forward to spent his leave with us, and now he is suffering in bed. My poor parents had just too much this year, first my accident, and now this bad illness and all the worry and anxiety it brings with it. Well, let’s hope that there will be no further complications and that about 2-3 months he will be feeling well again. I was, and all the family was sorry to hear that you are not coming this year to Geneva. It would have been lovely to see you again. How is Molly? And how are the young ladies? I hope all goes well for you. Please excuse this letter, which is rather shaky. I am still not quite well, it seems that my head is still not in a right place, and now it will be 3 months since the accident happened. Kindest regards from my parents and Vladimir, all our best wishes for you, Molly and the young ladies. Last night I met Stavropoulos at a party and he said that he had received a letter from your sister telling of your illness. I am greatly distressed because I feel certain that it was brought on mostly by your devoted attention to our report, working intensively and for long hours at a time without sleep. I just wanted to send you a note of good wishes for your speedy recovery. Please write me the good news that you are feeling fine again. I am returning to Washington tomorrow. Jack will meet Katzin in Rotterdam on July 1st to negotiate certain items of cost and expects to be back home by July 10th. The World Bank will continue to be my employer as I will be back at work on the old problems that are not as susceptible of definite solution as is canal clearance. My residence address is 2022 Columbia Road, N.W., Washington 9, D.C., telephone Executive 3-6360, extension 3931. Please remember me kindly to your Mother and Father. Just a note to tell you that during a farewell talk last night with Andy Cordier, he decided that he would ask you to prepare the report that the Secretary-General will submit to the General Assembly, or, at least that part of the report pertaining to our field operations. He said that I would be requested to come up to New York for reviewing this report before its submission. Andy also said that decision has not yet been made concerning how our report will be handled but he suggested, and I agreed, that perhaps it should be printed by U.N. as a basic document because so many governments are interested in having copies of our detailed report. In fact, several representatives have already spoken to me about it and of course I always refer them to the Secretary-General. I hope you are improving rapidly. I will be glad to see you again. I am leaving here in a few minutes to return to Washington. I was greatly distressed to receive your letter of 20 June telling of Vlado’s illness. I can only tell you how much we hope that he will speedily recover and that he will have the vacation to which he has been looking forward and which he has so well deserved. His work in Suez has received the highest possible praise from General Wheeler who, in addition, has told me of the great respect and warm affection which he has for Vlado. Vlado has undoubtedly been too modest to tell you of this, but I am sure your parents will be happy to hear of the high regard in which he is held by those who have worked with him. We are sorry to hear that you too had not yet gotten over the effects of your accident, but I hope that by the time this letter reaches you you will be completely well. Perhaps you will be able to come with Vlado when he returns to New York. Molly joins me in sending our love and best wishes to all of you. Please let me hear from you as to how Vlado is getting on. Although I couldn’t believe it when Karol told me, it’s really no wonder after the super-human feat you accomplished. I only hope you haven’t suffered too much. I know it has been awful for you and not only physically. But Vlado, the only way you’re going to lick this thing is with Rest & Diet. And complete rest – you must force yourself not to think of international affairs for now. And you can force yourself if you really want to. A friend of mine, who is a doctor, came down with it last spring and had to stop seeing her patients for a length of time. It was hell – she has a real vocation, she feels – but she did it. And now she’s cured. You’re so healthy anyway that you should recover easily & quickly. Don’t forget I took care of people with Hepatitis, so I know what I’m talking about. You know I miss you terribly, especially now it is hard. But I have beautiful memories. Like the night we went to the concert at the U.N. You kept looking at me from time to time and I was torn between listening to the music and wanting to look back at you – which I did. It’s so good to have the records of the music – that is your Overture to Egmont, & my Beethoven #7 & Scherzo from Midsummer Night’s Dream. I wonder why we love music – is it just because of the collection of harmonious sounds or does music contain something intangible. To continue through with my remembrance – Afterwards we went for a drink to Bemelman’s Cafe & talked about how stupid conformity was. And I knew right then that I more than liked you. I’ll never have to ask myself why I love you Vlado. You said that night that you felt comfortable with me. I hope this is always true because even though we haven’t had time to talk about everything, I think we feel the same about a lot of things. It’s time for bed now so I’ll say good-night and please be good to yourself, darling. This entry was posted in Dag Hammarskjold, Genealogy, Uncategorized, United Nations, UNSCO, Vladimir "Vlado" Fabry and tagged Athens, Cafe Geiger, Cairo, Colonel Katzin, Constantin Stavropoulos, Dag Hammarskjold, Don Sullivan, Egypt, Genealogy, General R. A. Wheeler, Geneva, Graham Greene, history, Ismailia, Love Letters, Mary Liz, New York, Olga Fabry, Pavel Fabry, Ralph Bunche, Rhodos, Rotterdam, Suez Canal, Switzerland, United Nations, UNSCO, Vladimir Fabry, Vlado Fabry, World Bank on April 21, 2014 by fabryhistory. This next series of letters is dedicated to my dear friend in Geneva, Simone, who was close friends with my mother-in-law Olinka. She was surprised when I told her that Vlado had left behind love letters, because she never heard anything about him having girlfriends. She rarely saw Vlado – he was like an apparition – but she has told me how much Olinka adored her brother, and worshiped him like a god. Simone is my favorite person, and I miss her, so these letters are my birthday gift to her. 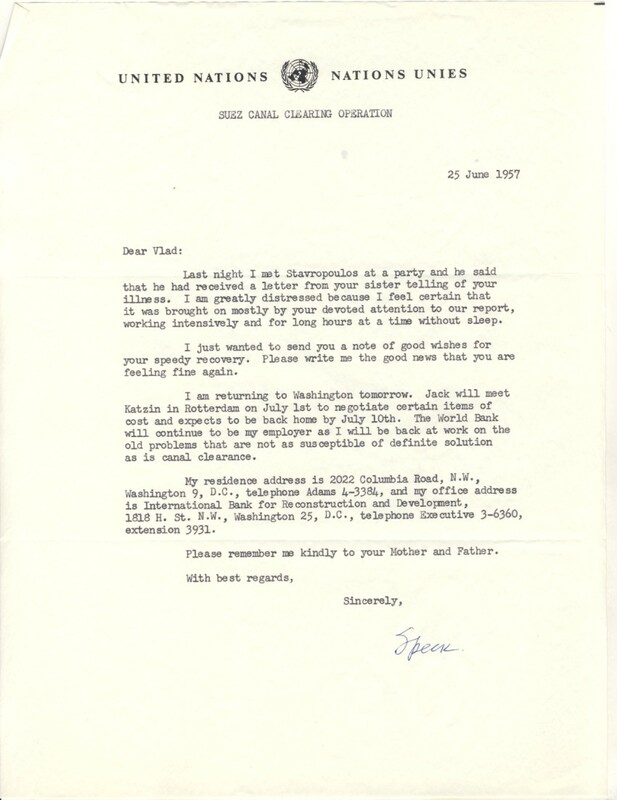 The only thing that is disappointing here is that Vlado didn’t keep copies of all the letters he wrote to Mary Liz, his romantic interest of 1957 (and beyond? ), but I can imagine Mary Liz must have treasured them. Perhaps they have been lost, but I hope they have been inherited by an appreciative family member, like myself. It made me very happy and at the same time a bit sad over my inadequacy to give as much in return as you offer to me. But I do love you – and you know it – as much as my queer warped nature permits me to, and I too and full of tender desire to protect you and make you happy and fill your life with excitement and joy. And I do miss you. It was so good to receive your letter – and I must say it came as a real surprise! I’m afraid I took you at your word when you said not to expect much in the way of letters. However, it didn’t arrive till last Tuesday (more than a week since you mailed it). The Ski Club misses you so much. Gary Karmilloff filled in for a while but now he has a London assignment so that the post of Liaison Officer (& V.P) is still vacant. They are planning a weekend in the middle of March to Manchester, Vt. and then I guess the season will be over – too short. Have you had a chance to ski in the Cedars of Lebanon? Ran into Peter Kempton the other day. You probably know he’s working with Hungarian Relief. Seems like one big happy family! And he is really enjoying the work, I think. When I read the last part of your letter (about your walk down by the lake) I wished I could fly right to you. But then I remembered what you once said about being close to someone even tho he was far away physically. I feel very near to you Vlado – maybe because you’re in my thoughts constantly. P.S. Let me know if I can send you anything e.g. books or food. Thank you for your beautiful letter and for making me so happy. And I am so overcome that it is difficult to put into mere words how I feel. When you come back I’ll really be able to tell you. Don’t be sad if it seems that you cannot give as much in return because that doesn’t concern me. Believe me when I say that it is not so much what comes back that is my happiness as it is the chance to give my love to you – freely. And your “good” nature makes me love you, so don’t accuse yourself that way again. I love you so much now, I can’t see any flaws. As far as form in letters goes I’m afraid I don’t pay much attention to it (as you can see from my letters). Content is more important to me and not only in letters but in literature too. Characterization & plot means more to me than language or style of writing – although I do appreciate the letter. You are working hard over there – by this time you must have weeks of compensatory time coming to you. When you mentioned in your letter about taking a trip to St. Catherine’s Monastery I recalled the first & only time I visited one. A girl from school was being “clothed” i.e. she received part of the nun’s regular habit thus marking passage from postulant to novice stage. Anyway – this was in a Carmelite Monastery which meant that this was to be the last time family & friends could see her – thereafter she would live a strict cloistered existence. So we could see her but only through an iron grille. Well one of her friends had brought along her four year old son, who appeared quite bright. However, at one point the nun had to leave the room for something and this little boy turned to his mother & said “Mommy, when is the lion coming back?” You can understand him in a way – it looked just like a cage. But I think he’s a little comedian. You mention doing a parbuckling job by using sheerlegs or a camel. Why don’t they use a parbuckle? But I get the impression that you are there for more than just the clearance operation. Do you have to have to stay there until the problem of administration of the canal is solved? More questions – is your secretary from Hdqs.? By the way, I must compliment you on your typing – so neat & hardly any errors. What can’t you do? Called Karol and asked about your apartment. He said David was having a fine time living there and, if it was Mr. Crandall you were wondering about, everything is all right with him. He asked about you, naturally, and I gave him all the news. And he said he was just as well pleased that you didn’t write to him since he then didn’t have to write back since, he said, he was not one for writing letters. Saw Dr. Kraus and he wants to see the x-rays before starting the exercises. But I don’t think it is necessary (exercises). I’m wearing high heels and can even run for the bus in the morning. Anyway I do have an appointment with him for next week. My doctor knows him – I don’t think very well – but then I guess most doctors know of him. Was just listening to the news and it said that by Tuesday the Canal would be open to all traffic. I know you’re hearing this from all sides but really you and the other people working on the Canal are to be congratulated (hope that doesn’t sound glib because I mean it). The World Telegram had a article some weeks ago about the General [R. A. Wheeler] and it said at the beginning there was some people who thought the clearance might take close to a year. So you must have a tremendous sense of accomplishment. Yesterday I ran into a girl I worked with at Shell Oil and she said their stock is almost up to what it was but that it had gone down $12 a share in the beginning — and Shell doesn’t even have holdings over there (Royal Dutch does, of course). Do you still manage to go swimming at lunch time? Karol told me to tell you not to anymore – because of the sharks – “we don’t want Vlado soup”, he said. Sometimes I see him in the hall – and the other day he had a wonderful opportunity to meet Helse. She and I were coming down the stairs from the fifth floor and he was walking toward the elevator. He walked past us first but then stopped to say hello but Helse had kept on walking since she was not coming with me anyway. But maybe he’s lost interest or something. The Ski Club had its party last Friday nite. At the home of a Mr. Caprario – friend of Dianea’s and not a member. He let us have the complete run of his six-room apt. – very kind and warm-hearted person. You know, even tho I keep meeting such good people you’re the best — of all –. Vlado, I love you so very much and I wish you were coming back soon. At the party I especially missed you and Bill Vaughn only made it worse by saying every time he bumped past me “Tell Vlado to come back – or When is Vlado coming back”. Mike Shaw was there and was nice enough to take me home. We left sort of early (12:30) because I had to get up at 8:00 the next morning and anyway he hasn’t been feeling well these days. He’s a good kid – a little affected sometimes but a good kid! The party went off pretty well — everyone cooperated wonderfully with the food and we had a film on Norway. The projectionist was telling me about the raw films they’ve received from Egypt and said I could come down and see some of them. While we’re on the subject of Egypt again — our Travel Counselor is now featuring the Land of the Pharaohs as the ideal place to spend your vacation. I’d like to know who’s kidding who – anyway I don’t believe there’s been much of a response. Still I’m wondering why the thought occurred to her. Dr. Kraus (saw him a 2nd time to show him the x-rays) sends his best regards and so does Christine and–I send you all my love. This entry was posted in Dag Hammarskjold, Genealogy, UNEF, United Nations, Vladimir "Vlado" Fabry and tagged Constantin Stavropoulos, Dag Hammarskjold, Egypt, Genealogy, General R. A. Wheeler, Ismailia, James Joyce, Love Letters, Mary Liz, Simone Baridon, Suez Canal, The Exiles, UNEF, United Nations, Vladimir Fabry, Vlado Fabry on April 9, 2014 by fabryhistory.